Novam primo mane surgentes induturi. Hoc suadent Manes, hoc canit Amramides. | Of his private life, little else is known, except that in 1721 or 1724, he was elected a fellow of the society of Antiquaries; and honourable notice is taken of him in the history of the society prefixed to the first volume of the Archæologia. He published, 1. “Monumenta Vetustatis Kempiana, &c.” 1720, 8vo. The greatest part of this collection was originally made by Mr. John Gailhard, who had been governor to George, first lord Carteret, and sold to his lordship for an annuity of 200l. After lord Carteret’s death in 1695, Mr. John Kemp bought a considerable part of the collection duriug the minority of John lord Carteret, afterwards earl Granville, and more after his death. Some years after Kemp’s death, the collection was sold by auction. 2. “Irtiov, sive ex veteris monumenti Isiaci descriptione Isidis Delubrum reseratum,” 1729, 4to. 3. “De Clypeo Carnilli antique,” 1734, which had before appeared at the end of “Museum Woodwardianum,” the latter part of which was drawn up by Ainsworth, though Dr. Woodward himself had described most of the statues, tables, and vases, and written large notes upon most of them. 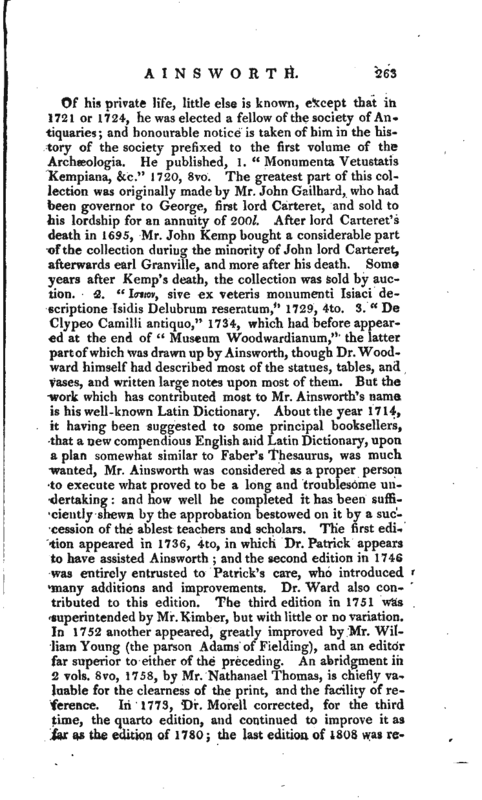 But the work which has contributed most to Mr. Ainsworth’s name is his well-known Latin Dictionary. 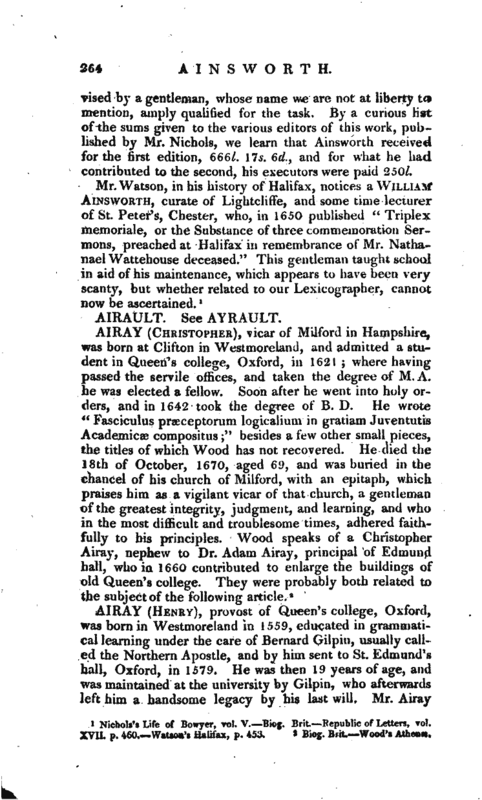 About the year 1714, it having been suggested to some principal booksellers, that a new compendious English and Latin Dictionary, upon a plan somewhat similar to Faber’s Thesaurus, was much wanted, Mr. Ainsworth was considered as a proper person to execute what proved to be a long and troublesome undertaking: and how well he completed it has been sufficiently shewn by the approbation bestowed on it by a succession of the ablest teachers and scholars. The first edition appeared in 1736, 4to, in which Dr. Patrick appears to have assisted Ainsworth; and the second edition in 1746 was entirely entrusted to Patrick’s care, who introduced many additions and improvements. Dr. Ward also contributed to this edition. The third edition irt 1751 was superintended by Mr.Kimber, but with little or no variation. In 1752 another appeared, greatly improved by Mr. William Young (the parson Adams of Fielding), and an editor far superior to either of the preceding. An abridgment in 2 vols. 8vo, 1758, by Mr. Nathanael Thomas, is chiefly valuable for the clearness of the print, and the facility of reference. In 1773, Dr. Morell corrected, for the third time, the quarto edition, and continued to improve it as far as the edition of 1780; the last edition of 1808 was | revised by a gentleman, whose name we are not at liberty to mention, amply qualified for the task. 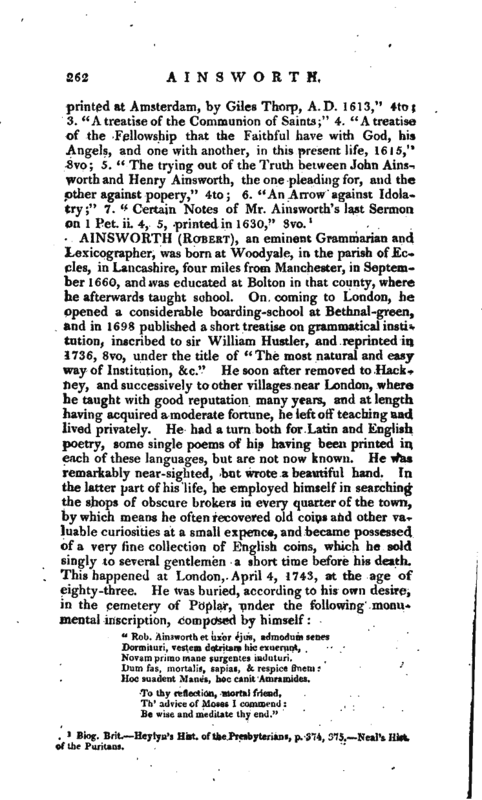 By a curious list of the sums given to the various editors of this work, published by Mr. Nichols, we learn that Ainsworth received for the first edition, 66 6l. 17s. 6d., and-for what he had contributed to the second, his executors were paid 2501. Nichols’s Life of Bowyer, vol. V. Biog. Brit. Republic of Letters, vol. XVIL p. 460. Watson’s Halifax, p, 453.